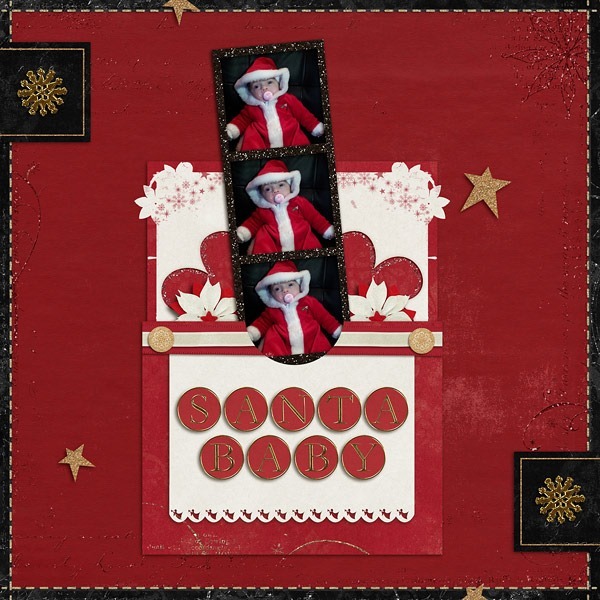 Credits: Layered template (Trial and Error, Template 4) by Little Bit Shoppe Designs and Merry Christmas by Mad Genius Designs. 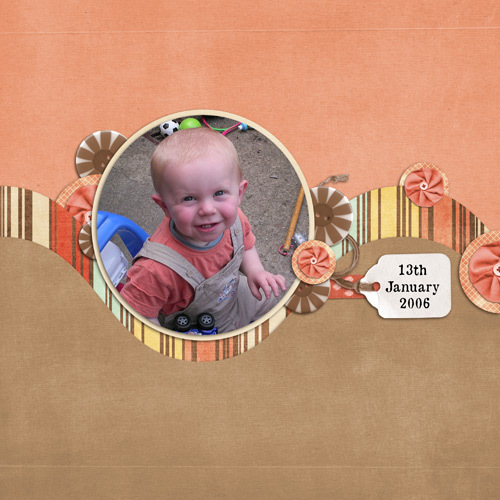 Credits: Layered template (Memory Makers Volume 17, Template 1) and Giggles both by Jen C Designs. Fonts are Chunk Type, Children In Need, Blush Bear and Pudsey Bear. 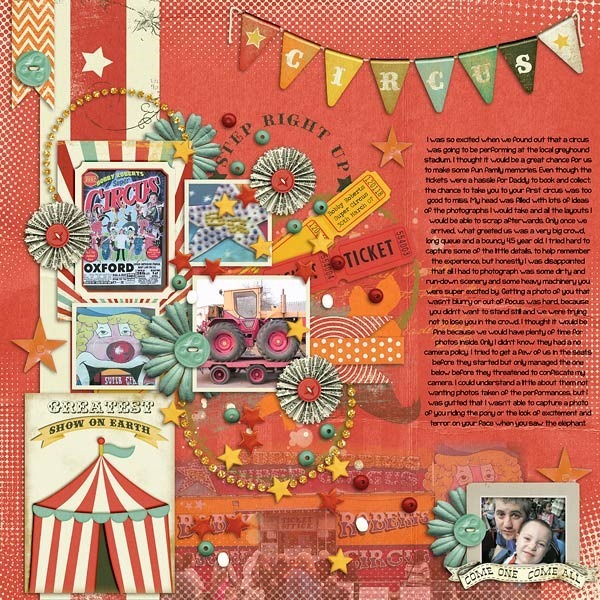 Credits: Layered template (Know It All, Template 1) by Little Bit Shoppe and Under The Big Top Collection by Meagan’s Creations. Fonts are KG Payphone by Kimberly Geswein and Travelling Typewriter. 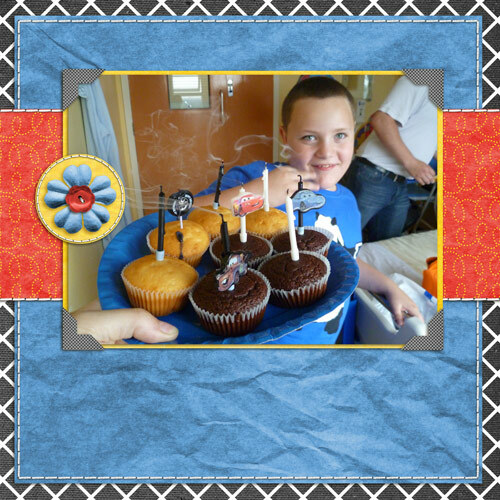 Birthday Party With Nan 2, originally uploaded by Lukasmummy. Credits: Layered template (Project Scrap 2011, January 2011, Single Template) by Shabby Princess and Kylie, Border Basics Squares and Border Basics Circles both by Libby Weifenbach/Pritchett and Be Happy by Jen C Designs. Birthday Party With Nan 1, originally uploaded by Lukasmummy. Credits: Layered template (Project Scrap 2011, January 2011, Multi Template) by Shabby Princess and Kylie, Border Basics Lines, Border Basics Squares and Border Basics Circles all by Libby Weifenbach/Pritchett and Be Happy by Jen C Designs. Font is Follow You Into The World by Kimberly Geswein. Journalling reads: When it comes to your birthday there always seems to be something that prevents it from turning out the way I had hoped. After last year, when you told me it was the “worst birthday ever”, I was desperate to try and make it up to you. But then Nan was readmitted to hospital, and things got difficult. I couldn’t plan any kind of amazing day out for you because I had to be close to the hospital incase Nan needed me. So I changed my plans and decided to throw you a birthday party at the hospital with Nan. You thought that it sounded like a lot of fun, so we packed up some food into the cool bag, bought some Ben 10 cups and napkins and some disposable plates and headed up to the hospital for the day. Since it would have been very difficult to pack, transport and cut a birthday cake we decided that muffins with birthday candles might be easier. You chose some Cars candles and after lighting them we sung Happy Birthday and you got to blow them out. Nan felt so special that you included her in celebrating your day. Walking Up The Slide (Right), originally uploaded by Lukasmummy. 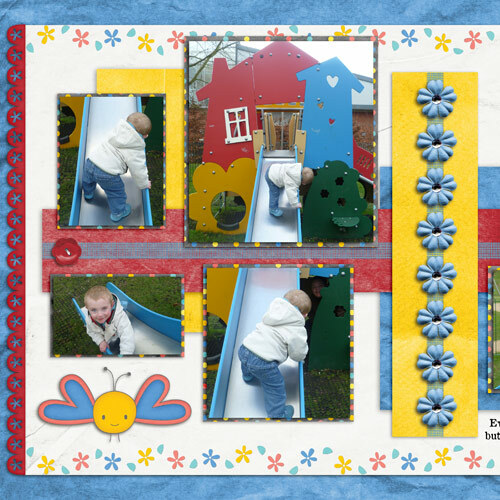 Credits: Layered template (Double Take Template Volume 2, Template 1) and Be Happy both by Jen C Designs. Font is Old Newspaper Types. 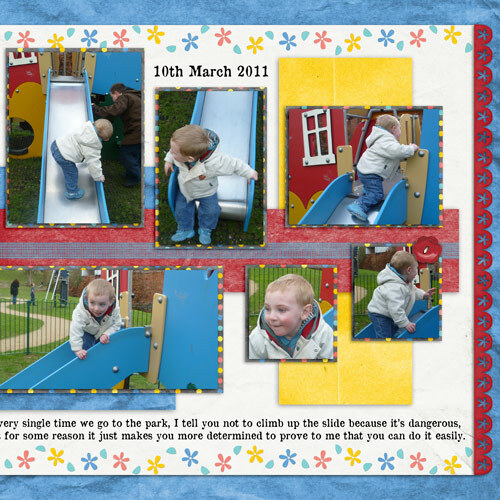 Journalling reads: Every single time we go to the park, I tell you not to climb up the slide because it’s dangerous, but for some reason it just makes you more determined to prove to me that you can do it easily. Walking Up The Slide (Left), originally uploaded by Lukasmummy. Birthday Muffin, originally uploaded by Lukasmummy. 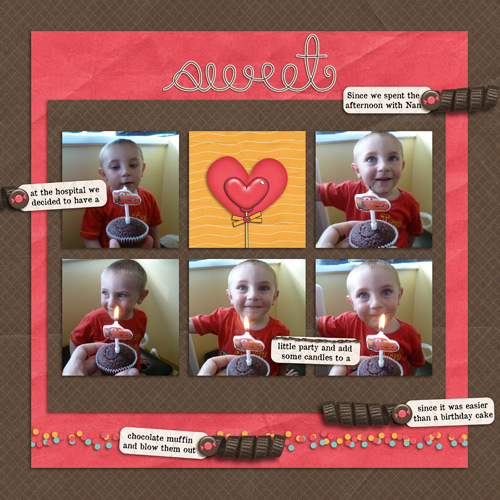 Credits: Layered template (August Template Challenge) by Christy Haig and Sweet On You by Jen C Designs. Font is Old Newspaper Types. 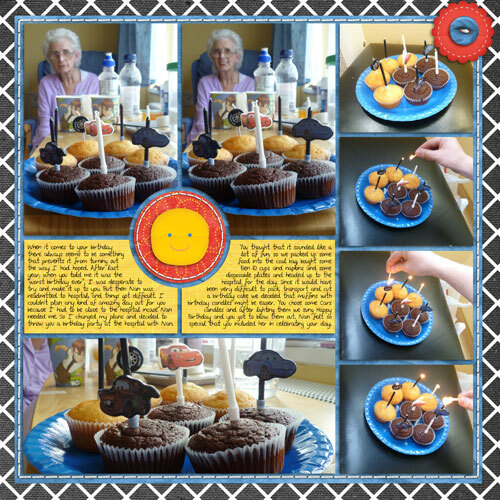 Journalling reads: Since we spent the afternoon with Nan at the hospital we decided to have a little party and add some candles to a chocolate muffin and blow them out since it was easier than a birthday cake. Josh On The Quad Bike, originally uploaded by Lukasmummy. Credits: Layered template (All Curves, Template 2) and It’s Summer both by Jen C Designs. Font is Old Newspaper Types.